Diabetes, briefly, is a disorder that affects blood sugar metablism in the body. The most common being Type 1 and Type 2. Type 1 predominantly affects children and is characterized by a failure of the body to produce sufficient insulin. Type 2 is the most common of all diabetes and is the form most commonly thought of and referred to when we say 'diabetes'. It is when the cells of the body have a poor or non-existent response to insulin and do not absorb or use the glucose in the blood stream which leads to many serious complications. Once diabetes has been diagnosed, it is typically considered a chronic condition and uncurable. If one understands the causes, however, one can take major steps to preventing its onset in the first place, and may even be able to influence the disease once diagnosed. A quick glance at the most commonly listed causes of diabetes on many of the major medical websites, typically list obesity and sedentary lifestyle as the primary factors. The CDC claims that these two factors account for over 95% of all Type 2 diabetes cases. Firstly, not everyone who is overweight has diabetes, and conversely, not everyone with diabetes is obese. It would be more accurate to say that people who are obese are more likely to develop diabetes. Secondly, what causes obesity? A knee-jerk common-sense type answer might be over-eating, but this doesn't seem to explain the significant number of people who are not overweight, but have diabetes. There are a large number of studies that have tackled this issue in much greater depth, and the information they reveal may give us real insight into how to solve this problem. A number of studies have asked the question, what causes some obese people to develop diabetes, but not others? One very strong answer has come from a study by Lee et al. in 2006 which found a very strong correlation between people who have been exposed to large amounts of persistent organic pollutants, i.e. pesticides, heavy metals, exhaust fumes, etc. and have a large amount of abdominal fat. These individuals had the greatest likelihood of developing diabetes, significantly higher than those were only toxic, or overweight, but not both. This is particularly interesting for a number of reasons. Many people tend to think of fat as an innert lump of mass that collects in some peoples body's simply to store the un-needed 'extras', but it is becoming more and more clear that this is simply not true. Fat tissue, particularly in the abdomen, releases a variety of signaling chemicals that influence the body in various ways, influencing hormone production, immune system response, and blood sugar metabolism. Fat tissue that has a large amount of persitent organic pollutants, or POPS, stored within it, tends to generate large amounts of these signaling chemicals and these can cause the body to behave in unwanted ways. Some medical professionals have started referring to this type of fat as "angry fat". People with angry fat have an enormously increased risk of health problems, including diabetes. But it seems that if this were the answer to diabetes, then skinny people wouldn't get diabetes right? Well, just because someone has a low body weight, or appears thin, doesn't mean they don't have a large amount of body fat. In fact, it is becoming increasingly common for people to be sarcopenically obese. This means that they have an extremely low amount of muscle and a very high amount of body fat, which is typically wrapped around the internal organs, instead of resting right up against the skin layers and protruding. These people are sometimes referred to as the "skinny fat people". These people have a type of invisible obesity that puts them at greater risk of diabetes and related conditions. In order to fight diabetes, prevention is the key. In order to prevent it, we have to maintain muscle mass. We have to maintain a low, but healthy amount of body fat, and we have to minimize our exposure to environmental pollutants in our food, and in our living and working environments in order to keep our fat cells tame and calm. Translated into practical terms, we have to eat the appropriate amount of calories for our body. We have to consume less proteins and refined carbohydrates, and include a much larger portion of vegetables in our meals. Eating organic and avoiding the use of harsh chemicals in our homes and work spaces will reduce our toxic burden. Regular exercise will build muscle mass and maintain a healthy body chemistry. But most of all, we have to abandon, the high-fat, high-sodium, sugar-rich, artificial ingredient foods that we as a nation have become addicted to. Fast-food, high-fructose corn syrup, preservatives, food coloring, and other artificial ingredients all contribute to the manufacturing of angry fat and obesity. Returning to more natural whole foods is one of the simplest and most cost effective ways to improve your health overall, not just to prevent diabetes. 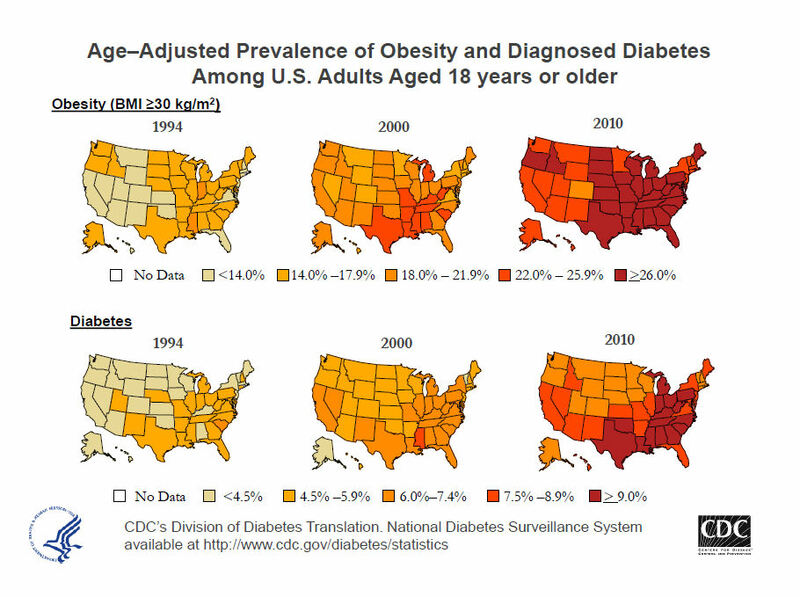 Obesity is not the cause of diabetes. Poor dietary and lifestyle choices are what cause obesity and diabetes. By making simple, but powerful changes in the way we live can save our children, as well as ourselves, the pain and suffering of diabetes and its related conditions like heart disease, kidney failure, and blindness. Not to mention that limb amputations and the truly horrible pain of feeling your body rot away. All of these things can be avoided, but they require a complete change from the status quo. Type 2 diabetes is when blood glucose levels become chronically elevated to the point that it causes a serous medical condition. In order to diagnose diabetes, the blood glucose level must be measured. Measuring total blood glucose has its problems, however. Blood glucose tends to change and fluctuate from hour to hour depending on eating habits and diet choices. For the past few decades, trying to establish a consistent pattern of elevated blood glucose has been sometimes difficult and early dabetes detection was problematic due to innaccurate testing. In 2010, the American Diabetes Association Standards of Medical Care added a new diagnostic criterion for confirming diabetes, A1C. A1C, is a type of blood protein that is used as a measurement of average blood glucose levels over the previous several weeks. This particular blood cell protein provides the most accurate blood glucose level testing to-date. A1C is measured as a percentage of total hemoglobin. The higher the percentage, the higher the blood glucose level. Diabetes diagnosis requires an A1C of 6.5% or higher. The Nutrikon Wellness Center offers a wide range of testing, including A1C measurement and complete blood chemistry analysis. The Nutrikon Wellness Center has a highly-effective diabetes program that utilizes specail nutrient formulas and individually-tailored diet and exercise programs that are based on in-depth testing of Body Composition Analysis, blood chemistry, genetic-testing, and other diagnostic tools. All of the program elements are designed to help maintain and normalize insulin and blood glucose levels in conjunction with a healthy diet and regular exercise. for the people who have already developed diabetes, it is not too late. Just because you have been diagnosed, doesn't mean that your situation can't improve. Many people have experienced remarkable improvement by applying the same fundamental dietary and lifestyle changes that prevent diabetes in the first place. Diet, exercise, elimination of angry fat, whole body detoxification have all created powerful changes in people with diabetes. Current medications can help keep diabetes where it is, but there are many inexpensive and simple actions that you can take to make a real difference for your body and compliment all the treatments you are already doing. All it takes is some education and self-discipline.